– to prepare the crust, combine all ingredients in a food processor and pulse until thoroughly combined. i used fresh almond flour (leftover from making almond milk) so it had moisture in it. if using a drier almond flour you may need to add a tiny bit of water. mixture should be slightly sticky. – evenly spread mixture into a 9.5″ removable bottom tart pan (or a traditional pie pan will work as well). 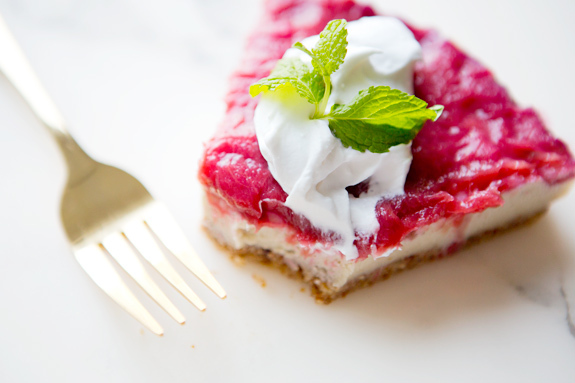 – add cheesecake mixture to the crust and refrigerate to set (give it a couple hours to really solidify. when ready to serve, spread the rhubarb mixture over top. – to prepare coconut milk whipped cream scoop out just the hardened coconut milk (you will break through it and reach the water at some point, set that aside for your next smoothie). in a mixing bowl combine hardened coconut milk with 1 tablespoon maple syrup and beat with a hand blender on high until light and fluffy. add more syrup if you prefer a sweeter whipped cream. – serve cake chilled, or freeze and serve slightly defrosted, it’s such a treat. enjoy! WOW! This is absolutely stunning, and sounds so so good! this is gorgeous and looks so creamy and delicious! what an amazing way to celebrate your anniversary! This sounds so delicious! And even better, it's soy-free! I cannot wait to try this once I'm finished with my whole30 challenge. Thanks for sharing! OMG – Those colors are insane! I'm totally sharing this with my no lactose-gluten peeps. This looks AMAZING! 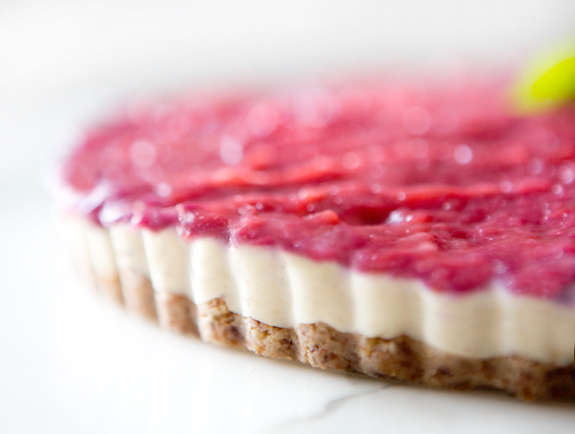 I adore raw desserts – They're always delicious. Can't wait to make this! I want to eat it and frame a picture of it! Haha! lovely! I think cashew based "cheese" cakes are better than the ushe. Thanks so much for sharing, I love your recipes!!! Beautiful! Excited to try out a healthy dessert! This looks delicious, but I must point out that honey is not vegan. Looks delightful!!!!! 🙂 Love rhubarb. Such a stunning dessert! 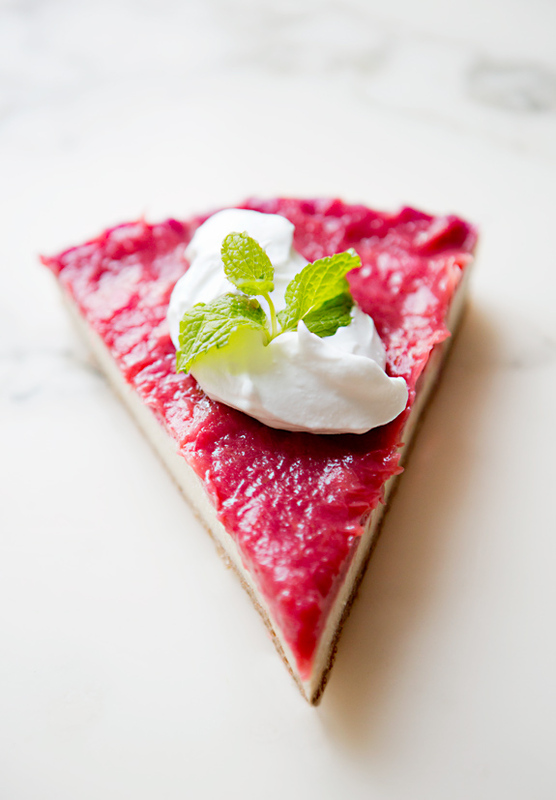 Rhubarb is amazing and I bet it enhances the flavor of this cheesecake so much. Made this a couple of days ago and it is amazing. Thanks so much for sharing! Made this tonight. The cashew filling is amazing. It is so creamy. Thank you for sharing. This was absolutely fantastic!!! My husband isn’t a fan of rhubarb but I am obsessed so hoping this freezes well:) thanks for the delicious recipe! What would be the ingrediants for strawberry version? This is so deicious! I’m very poorly and bed bound with M.E., have a chronic stomach illness and also suffer from anorexia so food is very important to me, and you’ve got the most incredible cheesecake recipe I’ve ever tried! I’m also a little pleased my fiancé doesn’t like raw so there’s all the more for me 😉 it’s got so much good in it too that I don’t feel bad after eating. He’s just made it again but swapped the rhubarb for blackberries and raspberries, used only 1 1/2 tbsp maple syrup and kept the lemon juice and, it was bloody incredible! Thank you so much 🙂 x .
Iabsolutely loved this cake! easy to make and very delicious. 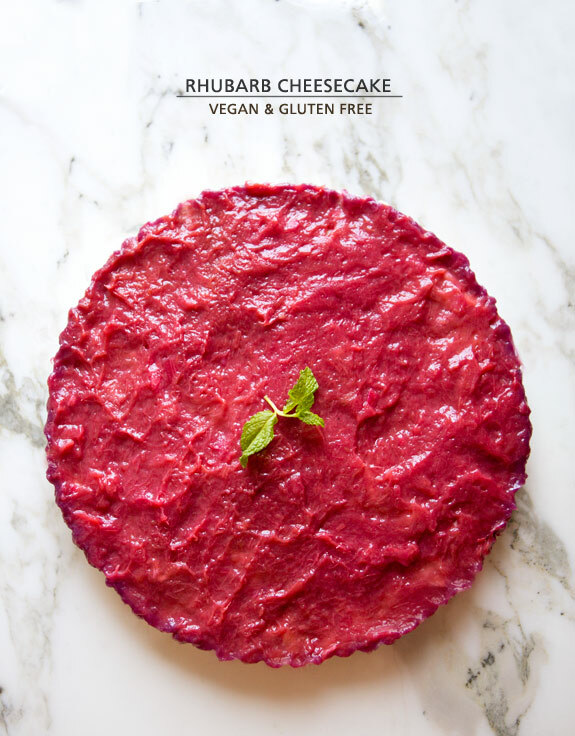 But mine didn’t turn out pink at all… instead it was green… Probably we have a different kind of rhubarb in Europe..
How much cream cheese would I need if I wanted to use cream cheese instead of cashews?